Efficient and affordable way to store motorcycles, mopeds. 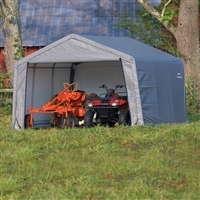 Designed for easy set up and portability, the ShelterLogic Shed-In-A-Box storage series efficient and affordable way to store motorcycles, mopeds, ATVs, lawn/garden tractors, snowmobiles, and other types of bulk storage. All Shed-In-A-Box shelters feature high-grade steel frame construction that is finished with a Dupont powder coating that prevents chipping, peeling, rust and corrosion. You'll be able to create a durable shelter quickly thanks to the rugged Ratchet Tite tensioning system and ShelterLock stabilizers. 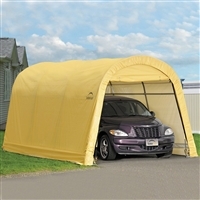 The waterproof, triple-layer shelter cover features a heat-bonded enhanced weave polyethylene construction, and it's been UV-treated inside and out with added fade blockers, anti-aging, so it will withstand the elements for years to come. In addition to an all-steel frame and waterproof cover, this package includes double-zippered door panels, stabilizing blocks, auger anchors, steel foot plates, and easy-to-follow step-by-step instructions. 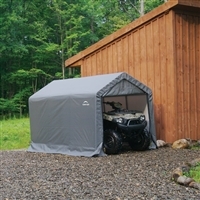 Garage space or create your own storage building with this ShelterLogic portable shed-in-a-box. 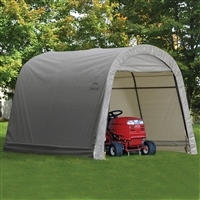 The shed--which offers an ideal shelter for tools, lawnmowers, or even a tractor--is tough and weather-resistant, with a heavy-duty all-steel frame bonded with a DuPont thermoset baked-on powder-coated finish. As a result, the frame resists chipping, peeling, rust, and corrosion, helping it hold up to long-term use. The cover is just as tough thanks to the triple-layer, chemically heat-bonded ripstop polyethylene cover, which is UV-treated inside and out with fade blockers and anti-aging, anti-fungal agents. The cover helps the shed and its contents withstand heavy rains, howling winds, and all the other elements Mother Nature has in store. Finally, the shed includes a Rugged Ratchet Tite tensioning system that makes setup easy while keeping the cover tight to the frame. Other features include a solid rear panel, ratchet tie-downs, auger anchors, and steel foot plates. This E Series ShelterLogic shed measures 10 by 8 by 10 feet (W x H x D).